Pre Nuptial Agreements are an agreement entered into by a couple before their marriage/civil partnership takes place. It sets out how their assets would be divided if they divorce or dissolve their relationship. Pre Nups, as they are often called, frequently hit the headlines in respect of the rich and famous. Emmersons Solicitors Family Law Department are often asked to draft Pre Nuptial Agreements, especially by couples who have children from previous relationships. I am frequently asked about the value of instructing an expert solicitor to handle a divorce. I have put together this useful guide which will answer many of your questions. 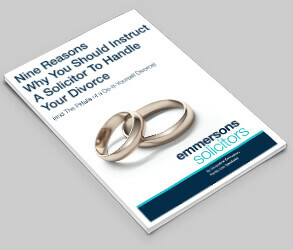 If you are contemplating a divorce or separation, and wondering whether you need a solicitor to assist you, then our guide will help you to decide. Consider Beth and John who are to be married soon; Beth has adult children from a former marriage, she owns her own home. John doesn’t have any children and his property is worth less than Beth’s. The couple have agreed that Beth will leave most of her estate to her children and not to John. She will not seek an interest in John’s property. In this case as well as drawing up the Pre-Nup (Pre Nuptial Agreement), I would also deal with Beth’s will and would make sure that she owned her home on her own rather than with John. Recent case law has suggested that to be considered by a court a Pre-Nup (Pre Nuptial Agreement) should be signed by the parties at least 28 days before the marriage, both parties must make full financial disclosure of all of their assets to one another before the agreement is signed and each party should receive independent legal advice before signing. Otherwise there could be a suggestion that a party who did not receive advice was at a disadvantage when the Pre Nuptial Agreement was signed. It is also possible to protect your estate for your children even if you are not married to the person with whom you live, contact Emmersons Solicitors for further advice regarding Pre Nuptial Agreements. Regulated and Authorised by the Solicitors Regulation Authority. Copyright © 2016 Emmersons Solicitors. All rights reserved.